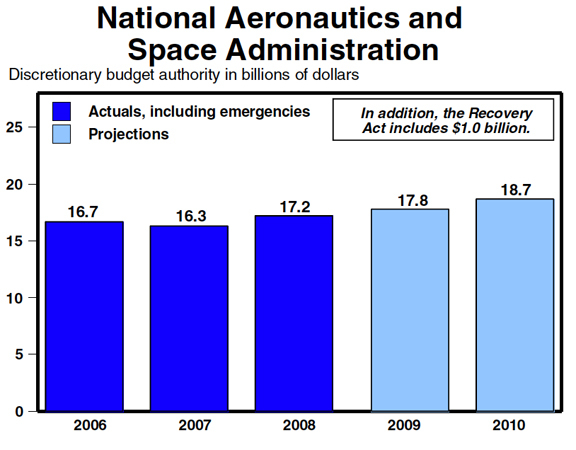 The President's Fiscal Year 2010 Budget provides $18.7 billion for the National Aeronautics and Space Administration (NASA) which, when combined with the $1 billion provided for NASA in the Recovery Act, is more than $2.4 billion above the 2008 level. The Budget funds a program of space-based research to advance our understanding of climate change and its effects, as well as human and robotic space exploration. It also supports the use of the Space Shuttle to complete assembly of the International Space Station. Advances global climate change research and monitoring. Using the National Research Council's recommended priorities for space-based Earth science research as its guide, the agency will develop new space-based research sensors in support of the Administration's goal to deploy a global climate research and monitoring system. NASA will work to deploy these new sensors expeditiously while coordinating with other federal agencies to ensure continuity of measurements that have long-term research and applications benefits. Funds a robust program of space exploration involving humans and robots. The agency will create a new chapter of this legacy as it works to return Americans to the Moon. NASA also will send a broad suite of robotic missions to destinations throughout the solar system and develop a bold new set of astronomical observatories to probe the mysteries of the universe, increasing investment in research, data analysis, and technology development in support of these goals. Completes the International Space Station and advances the development of new space transportation systems. NASA will fly the Space Shuttle to complete the International Space Station and then retire it in 2010; an additional flight may be conducted if it can safely and affordably be flown by the end of 2010. Funds freed from the Shuttle's retirement will enable the agency to support development of systems to return humans to the Moon. As a part of this effort, NASA will stimulate private sector development and demonstration of vehicles that will support the agency's space flight requirements. Continues support of the International Space Station. NASA will continue to assemble and utilize the International Space Station. NASA also will continue to coordinate with international partners to make this platform available for other government entities, commercial industry, and academic institutions to conduct research. Renews NASA's commitment to aeronautics research. NASA will renew its commitment to cutting-edge, fundamental research in traditional and emerging disciplines to help transform the nation's air transportation system and to support future aircraft. NASA research will increase airspace capacity and mobility, enhance aviation safety, and improve aircraft performance while reducing noise, emissions, and fuel consumption. Provides $18.7 billion for the National Aeronautics and Space Administration. Combined with the $1 billion provided to the agency in the American Recovery and Reinvestment Act of 2009, this represents a total increase of more than $2.4 billion over the 2008 level. Funds a program of space-based research that supports the Administration's commitment to deploy a global climate change research and monitoring system. Funds a robust program of space exploration involving humans and robots. The National Aeronautics and Space Administration will return humans to the Moon while also supporting a vigorous program of robotic exploration of the solar system and universe. Funds the safe flight of the Space Shuttle through the vehicle's retirement at the end of 2010. An additional flight will be conducted if it can be completed safely before the end of 2010. Funds the development of new space flight systems for carrying American crews and supplies to space. Funds continued use of the International Space Station to support the agency and other Federal, commercial, and academic research and technology testing needs. Funds aeronautics research to address aviation safety, air traffic control, noise and emissions reduction, and fuel efficiency. Advances Global Climate Change Research and Monitoring. The National Aeronautics and Space Administration's (NASA's) investment in Earth science research satellites, airborne sensors, computer models, and analysis has revolutionized scientific knowledge and prediction of climate change and its effects. Using the National research Council's recommended priorities for space-based Earth science research as its guide, NASA will develop new space-based research sensors in support of the Administration's goal to deploy a global climate research and monitoring system. NASA will work to deploy these new sensors expeditiously while coordinating with other Federal agencies to ensure continuity of measurements that have long-term research and applications benefits. Funds a Robust Program of Space Exploration involving humans and Robots. NASA's astronauts and robotic spacecraft have been exploring our solar system and the universe for more than 50 years. The Agency will create a new chapter of this legacy as it works to return Americans to the Moon by 2020 as part of a robust human and robotic space exploration program. NASA also will send a broad suite of robotic missions to destinations throughout the solar system and develop a bold new set of astronomical observatories to probe the mysteries of the universe, increasing investment in research, data analysis, and technology development in support of these goals. Completes the international Space Station and Advances the development of New Space Transportation Systems. NASA will fly the Space Shuttle to complete the International Space Station and then retire the Shuttle in 2010; an additional flight may be conducted if it can safely and affordably be flown by the end of 2010. Funds freed from the Shuttle's retirement will enable the Agency to support development of systems to deliver people and cargo to the International Space Station and the Moon. As part of this effort, NASA will stimulate private-sector development and demonstration of vehicles that may support the Agency's human crew and cargo space flight requirements. Continues Support of the international Space Station. NASA will continue to assemble and utilize the International Space Station, the permanently crewed facility orbiting Earth that enables the Agency to develop, test, and validate critical space exploration technologies and processes. NASA also will continue to coordinate with international partners to make this platform available for other government entities, commercial industry, and academic institutions to conduct research. of aeronautics research and technology contributes to the economic well-being and quality of life of American citizens. NASA will renew its commitment to cutting-edge, fundamental research in traditional and emerging disciplines to help transform the Nation's air transportation system and to support future aircraft. NASA research will increase airspace capacity and mobility, enhance aviation safety, and improve aircraft performance while reducing noise, emissions, and fuel consumption.